Nepal’s new social security scheme—a campaign that marketing analysts said was worth millions of rupees – was overshadowed by a government publicity stunt. For many, it was more of the same. 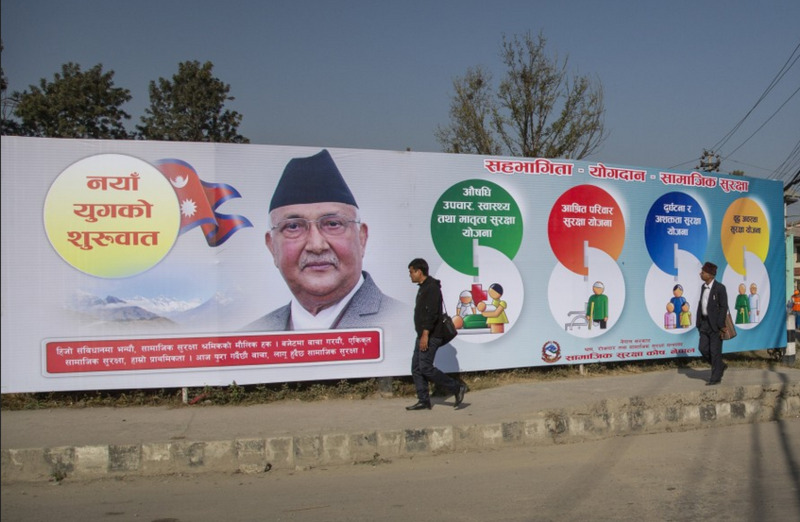 Over a dozen newspapers, online news outlets, floating street banners and billboard posts were plastered with the prime minister’s image announcing the social security scheme—a campaign that marketing analysts said was worth millions of rupees. Instead of informing the public about the benefits and procedures of the scheme, the advertisements appeared to give credit for the single largest reform in the labour industry to the incumbent government, even though the programme had been approved before the Oli administration came to power. An official at the Prime Minister’s Office said the entire advertising campaign cost around Rs120 million, which included design and production charges. “However, the contribution from the state coffers is nominal,” said the official who only agreed to speak on condition of anonymity. A number of leading financial institutions, telecom service providers and airline companies sponsored the jacket advertisements in the newspapers, and the official refused to disclose the actual amount spent by the government. The Post contacted three officials at the companies that paid for the advertisement in the national dailies. The representatives, all of whom asked not to be named because they were not authorised to discuss details of the sponsorship, said officials at the Social Security Fund, Nepal Telecommunications Authority, and the central bank had called them to sponsor the publicity. “It was more of an order than a request,” said a senior official from a company that advertised the jacket ad in a leading newspaper. Another official from another firm told the Post they felt like they had no option but to oblige with the government authority’s order even though they didn’t have an allocated budget for Tuesday’s commercials. A chief executive officer from one of the banks that funded the advertisement in a national daily said he was asked by the Office of the Social Security Fund. “We took it as an opportunity to brand our bank,” he said. According to the Advertising Association of Nepal, the cost of running a jacket ad and a homepage ad online in all national newspapers could cost about Rs35 million. “The amount stands at around Rs75 million for one-day publicity in the entire media platform,” said Rabindra Kumar Rijal, president of the association. Rijal said that doesn’t include the designing and production costs. Although the idea–and the content–of the social security policy has received nationwide applause, the government’s attempt to glorify the prime minister has drawn widespread criticism on social media platforms. “The scenes once visible in every nook and corner in Soviet Russia have now reappeared in our country and it begs a question: Sir, who gives you such mischievous ideas?” Ramesh Koirala, a cardio surgeon at Ganga Lal National Heart Centre, wrote on Twitter. Others saw the move as an influence from Indian Prime Minister Narendra Modi, whose images are often plastered on front page advertisements in leading national publications. During a programme to officially unveil the scheme, Oli was unapologetic in his response to the criticism and said the publicity was a deliberate attempt by the government to let the country know what his administration was doing.